I met Matt one afternoon as he stood among the masses at the southwest corner of Madison Square Garden, waiting for a bus out of town. The message is simple: silence is golden. I love how the side skulls spill off of the front skull, and how the teeth of the primary jaw are fused together. Matt attributes this piece to "deep life experiences" and how it serves as a reminder to keep his head on straight. He told me he's "been low and wants to stay higher" and that "keeping what I've done to myself has given me the ability to achieve what I have in life". 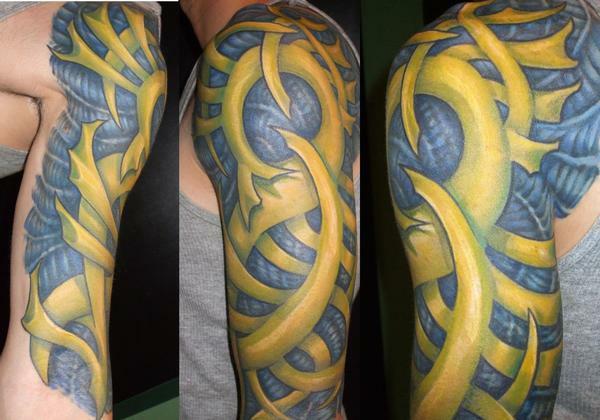 This tattoo was inked by Loki M. LaChapelle when he was at Kaleidoscope Tattoo & Art Gallery in Cambridge, Massachusetts. Loki now works out of Mazel Custom Tattoo & Piercing in Everett, Massachusetts. 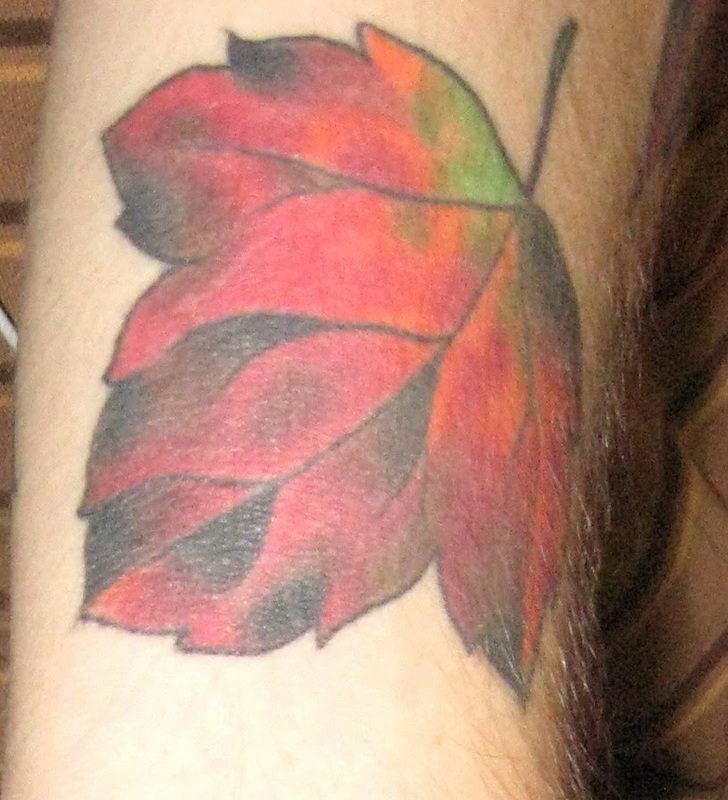 Thanks to Matt for sharing his tattoo with us here on Tattoosday! 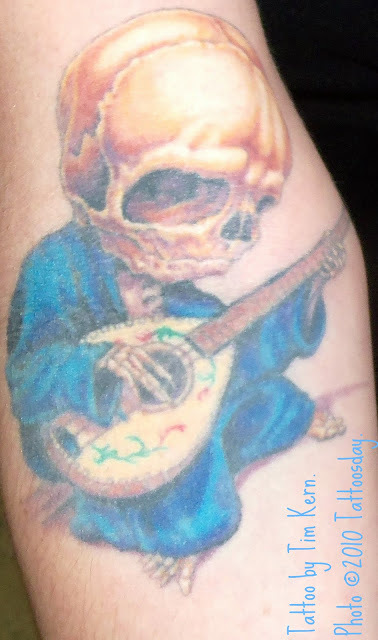 Earlier this summer, I posted a couple of tattoos from Joe, seen here. "The picture is fresh from the artist finishing it. 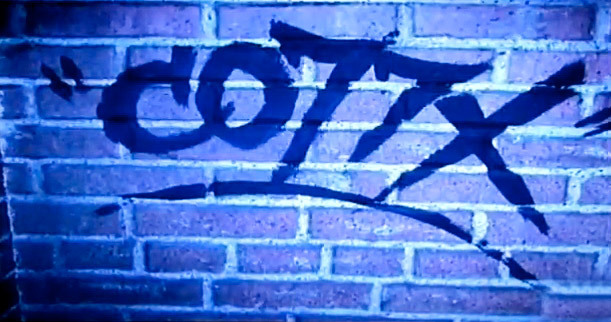 It is "C077X" and is a nod to James Franco and General Hospital. He is my fav actor and I have been watching General Hospital for at least 21 years. It is the the tag that "Franco" sprayed on everything when he recently guest starred on GH as an artist/serial killer. His character's name is Franco, reflecting that art imitates life. A motto the actor and character believe, and so do I. That is why I got the tattoo. To prove art imitates life!" The tattoo was inked by Rob at Brooklyn Ink. Rob originally appeared here as a contributor here. 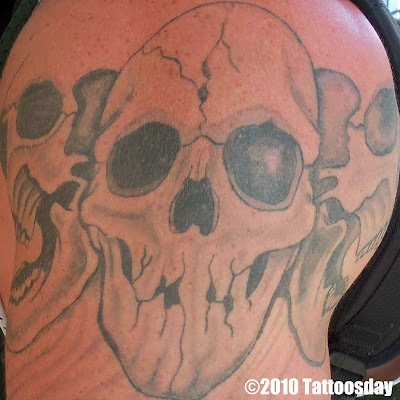 And is one of several artists that has represented Brooklyn Ink over the years on Tattoosday. This label links all of the work from the shop previously seen on Tattoosday. Thanks to Joe for sharing his new tattoo with us here on Tattoosday! The same night I met Brian, I met Rachel, who has eight tattoos. This piece on her left biceps is based on the work of artist Kurt Halsey. 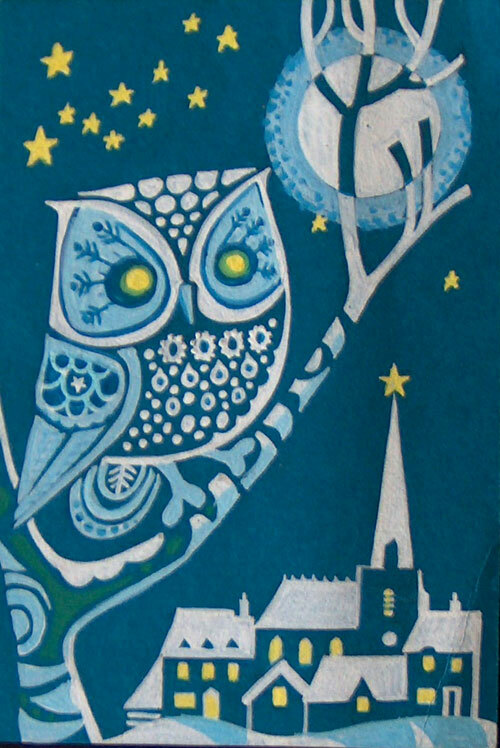 This little bird appears in multiple works by the artist, but Rachel imagined it for her own personal situation. 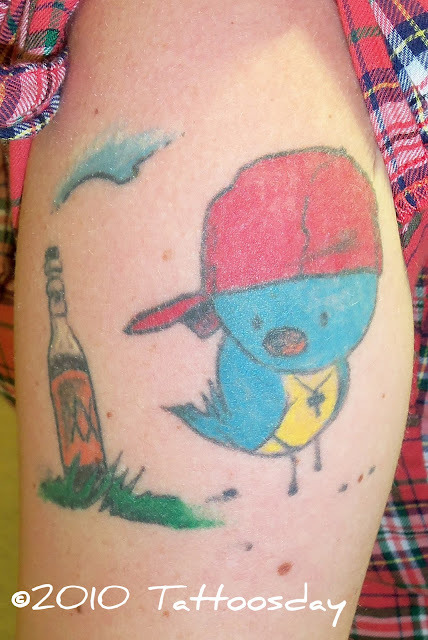 She got it after a break-up a couple of years ago, and the tattoo gave her the strength to "let the bird go". In this case, the bird represents the ended relationship and the tattoo is a transitional piece that helped her recover from the difficulty of moving past it. 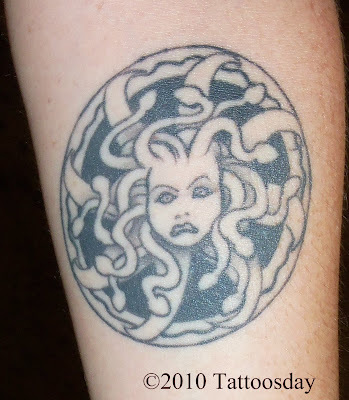 From Memphis, Tennessee, Rachel had this inked at Underground Art Tattoos and Body Piercing by Chris Fitzgerald. Chris had been a piercer at the shop and then moved into tattooing. He has since left tattooing and moved to photography. His new business is Cult Noir Photography, and his work can be seen here. 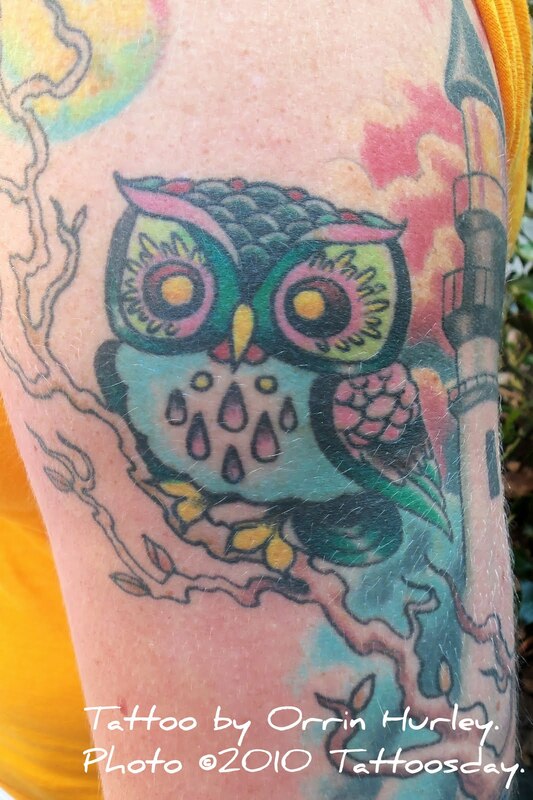 Thanks to Rachel for sharing her tattoo with us here on Tattoosday! I met Brian in Barnes & Noble, Union Square, back in August and he shared two tattoos with us. Put your thinking caps on, folks, because Brian, who is a video artist (website here), has very cerebral ink. This tattoo is based on an illustration entitled "Every Night We Are Haunted by a Dream" by the artist Alfred Kubin (1877-1959). 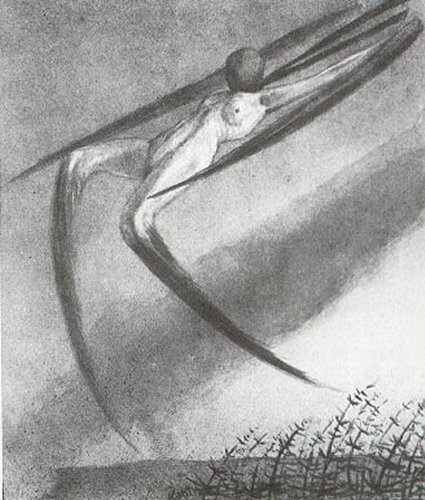 Brian explained that this work corresponded very closely to the publication of Sigmund Freud's The Interpretation of Dreams, and that Kubin's illustration represents "art between the cusp of pre-surrealism/expressionism and surrealism". It speaks to Brian's understanding of the perception of dreams and art. 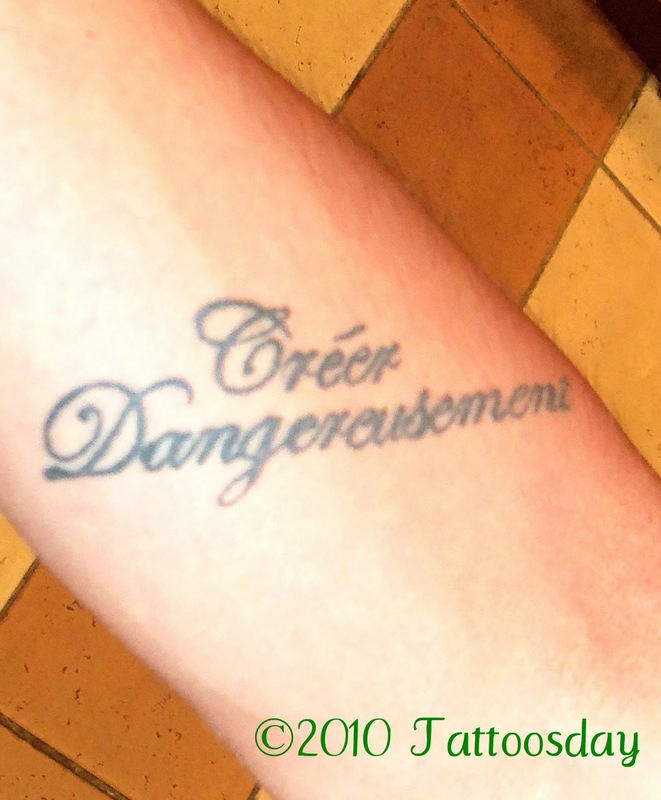 The words "Créer Dangereusement" are the French title of a 1957 essay by Albert Camus entitled "Create Dangerously". This "essay on realism and artistic creation" likewise spoke to Brian who acknowledged that "all art is a political act". It makes perfect sense, if you think about it, in that no great work of art was ever created by the artist playing it safe. It is those who created dangerously that are remembered as trailblazers and icons in their respective fields. 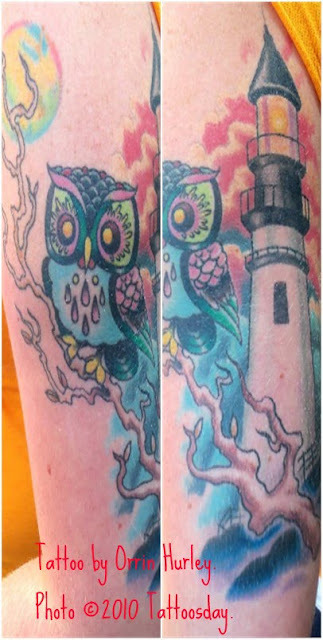 Brian had both of these tattoos done in Austin, Texas. 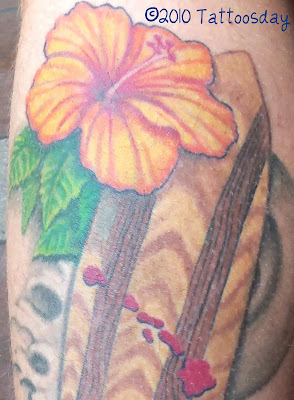 Thanks to Brian for sharing his artistic ink with us here on Tattoosday! I met Danny in Penn Station early in August just as he was about to board a train. He explained that the koi swimming upward on his bicep represented that he was still moving upstream, that is, he was "still overcoming struggles, trials and tribulations". He added that he would get another koi on his left arm, facing downstream, when he had completed his struggle in life. "The leaves are Japanese maples...Everyone gets the traditional lotus flowers, etc. But I chose a leaf that represents no religion or significant meaning to it. I would have gone with the Korean national flower [Hibiscus syriacus] but that, too, had meaning behind it. Many flowers that are traditionally on bodies are either Buddhist or Catholic, etc. Coming from a Christian background, I chose one without any meaning. How can I live with a Buddhist lotus on my arm? At the time I got the tattoo I was confused with life... Direction, purpose, goals, meaning.. I had obstacles and self goals I had to achieve and was in a standstill (not drug-related or any of that sort). I looked to the pain tattooing offers and how it puts your mind in a zoned-out state, which I now thrive for when I'm stressed. It's therapy to me. I'll update you when I find an artist to finish this tattoo. The windbars were left open to expand." The tattoo was done by Lee at Infinity Tattoo in Manhattan. 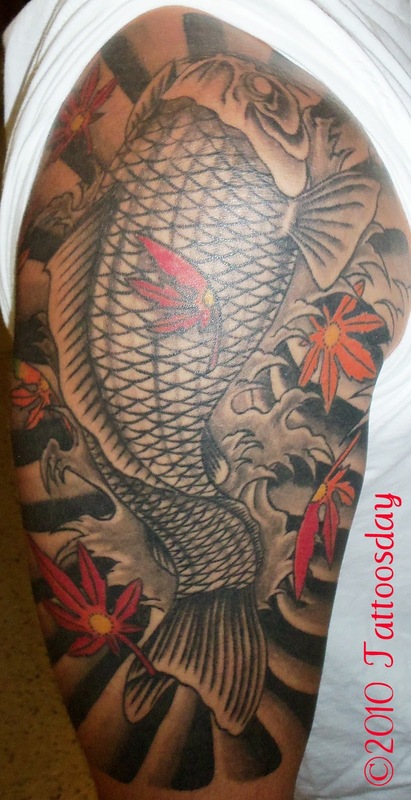 Thanks again yo Danny for sharing his koi with us here at Tattoosday! Earlier this month, I met Steve on the D train, as we headed home to Brooklyn. 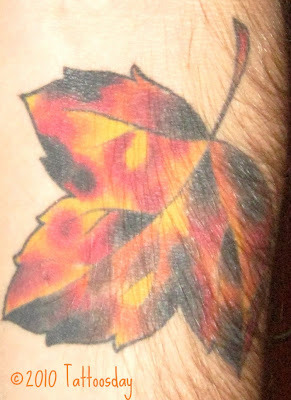 He had a veritable panorama of fall foliage on his left arm and he happily shared his autumnal tattoos with us here at Tattoosday. It only seemed fitting that, as summer has ended, we celebrate the new season with some fall colors. 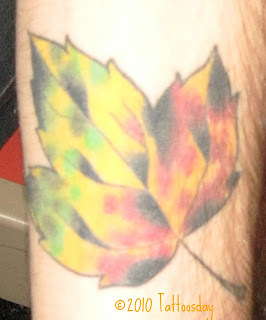 The eleven maple leaves on Steve's arm were all inked free hand by Mark Harada at Manhattan's East Side Ink over four sittings. Steve acknowledges that the leaves changing colors represent a change, and these colorful symbols remind him that change is good. Happy Autumn to all! And thanks to Steve for sharing his fallen maple leaves with us here on Tattoosday! I met Sara on the 36th Street subway platform in Brooklyn last month during the late afternoon rush hour commute. Sara filled me in. She has three tattoos and this passage "spoke to her". She wanted something religious for her 30th birthday. This is an excerpt (verse 4) from Psalm 37 in the Bible. 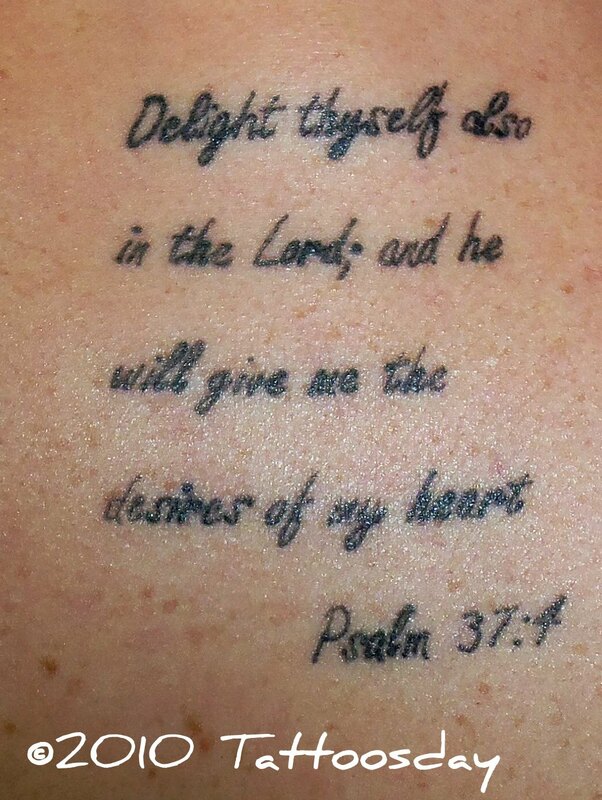 The verse reads "Delight thyself also in the Lord, and he shall give thee the desires of thine heart" [King James Version]. Sara changed the thee and thine to read me and my, respectively, making the verse more personal. This was tattooed by Alex Franklin at Brooklyn Ink in Bay Ridge. Work from Brooklyn Ink (and much from Alex) can be seen on this Tattoosday label here. 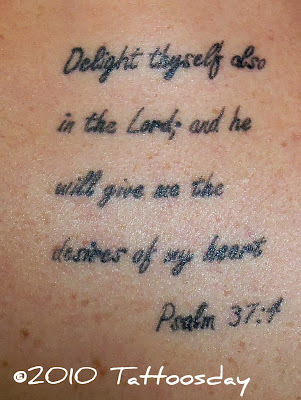 Thanks to Sara for sharing her source of inspiration with us here on Tattoosday! 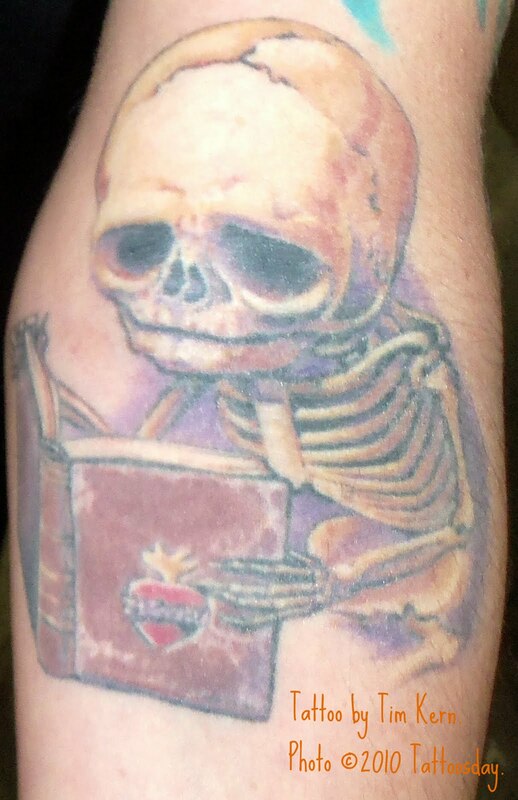 One thing regular readers may notice is that I tend to prefer singular tattoos, as opposed to larger "concept" pieces. This preference is what you see illustrated here on Tattoosday. However, once in a while, I see work that, although atypical of our content, is irresistible. Representing thirty-two hours of work by Mike Boissoneault at Black Lotus Tattoo Studios, in North Kingstown, Rhode Island, Khalil explained that this vision represents a spin on a biomechanical design, "but more organic". To him, in a world in which people are becoming less human, this tattoo reminds him to be human. Thanks again to Khalil for sharing this amazing work with us here on Tattoosday! I met Christina one day after work while walking outside of Madison Square Garden. 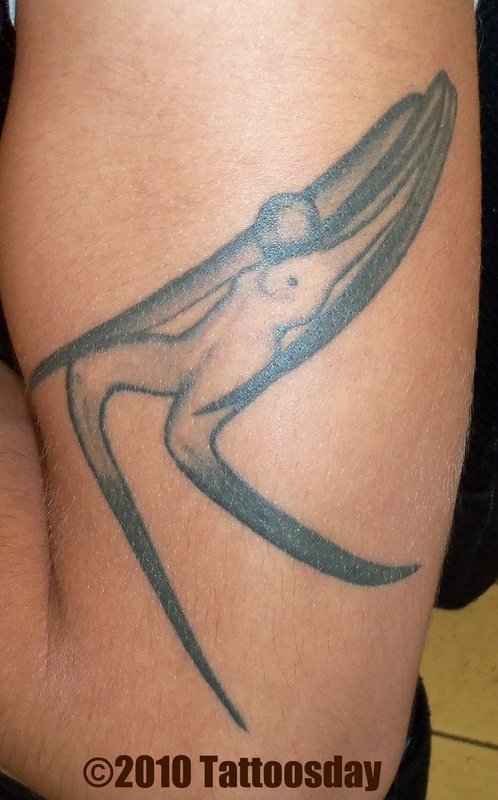 This tattoo that covers her upper left arm was actually done in two segments by artist Orrin Hurley, who currently tattoos at Dare Devil Tattoo in Manhattan. The lighthouse was inspired by the Portland Head Light on Cape Elizabeth, Maine. Thanks to Christina for sharing her tattoo with us here on Tattoosday. At the end of July, I ran into Stacy waiting for the F train at West 4th Street in Manhattan. Stacy is a poet and the Artistic Director of The Poetry Project at St. Mark's Church in New York City. She has been here five years and originally hails from Milwaukee. Living next to Lake Michigan has many benefits. Having always lived in a location near a large body of water, I can relate to her admiration for the beauty of a seascape, whether it be an ocean or a great lake. Stacy told me she enjoyed watching the tugboats in her home town, and that these small vessels are a "connective image" that draws her back to her original home. This tattoo was designed and inked by Stephanie Tamez at New York Adorned. Work from Stephanie on Tattoosday can be viewed here. This is also the second tugboat of the summer. The first one is here. 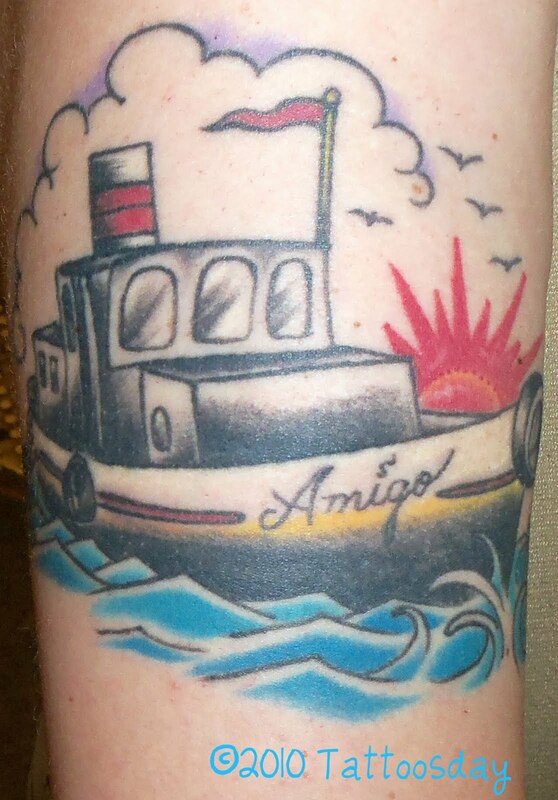 Thanks to Stacy for sharing her tugboat with us here at Tattoosday. Perhaps we'll see her panther when the Tattooed Poets Project returns next April for its third year! Last month I met Melinda on the West 4th Street subway platform, a location I came to appreciate this past summer for its diversity of interesting tattoos. Our conversation began on the platform in Manhattan and ended in Brooklyn after a trip on the D train. She explained that this tattoo is based on the shield of Minerva (in the Roman pantheon) and Athena (in the Greek pantheon). The shield features the head of the serpentine-tressed Medusa who, if you didn't know, could turn creatures (men, mostly) to stone with a simple gaze. Melinda loves the contrast between the Minerva and Medusa figures and the relationship between the two mythologies. 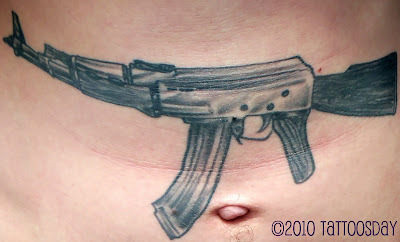 The tattoo was inked by Kelly Krantz, of the now defunct Hold Fast Tattoo in Brooklyn. Kelly now tattoos by appointment only, and more details can be found on his website here. Work by Kelly has appeared previously on Tattoosday here. Thanks to Melinda for her good company on the D train back in August, and for sharing her tattoo with us here on Tattoosday! I met Liz last month on the West 4th Street platform as we were waiting for the D train. She has six tattoos, including a really cool Brooklyn Bridge tattoo that she designed and, she proudly told me, Exene Cervenka once complimented her on. The piece was modeled after the fossil displayed prominently in The American Museum of Natural History, where her brother had worked for a period of time. 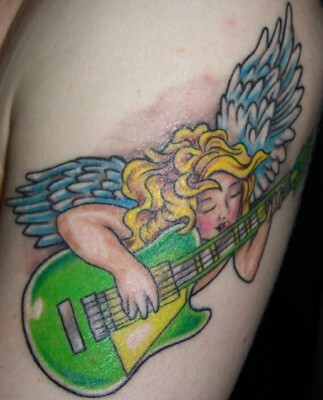 The tattoo is an homage to the time she spent there. 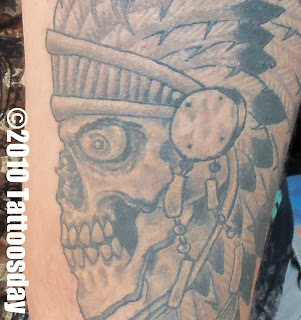 The tattoo was inked by Christopher Depinto aka The Ink Shrink at Shotsie's Tattoo in Wayne, New Jersey. Work from Shotsie's has appeared previously on Tattoosday here. Thanks to Liz for sharing her dinosaur tattoo with us here at Tattoosday! I spotted Tyler outside of my office building on Seventh Avenue last month. One of three tattoos he has, Tyler explained that he really likes traditional designs, and that eagles, in his opinion, are among the coolest animals. 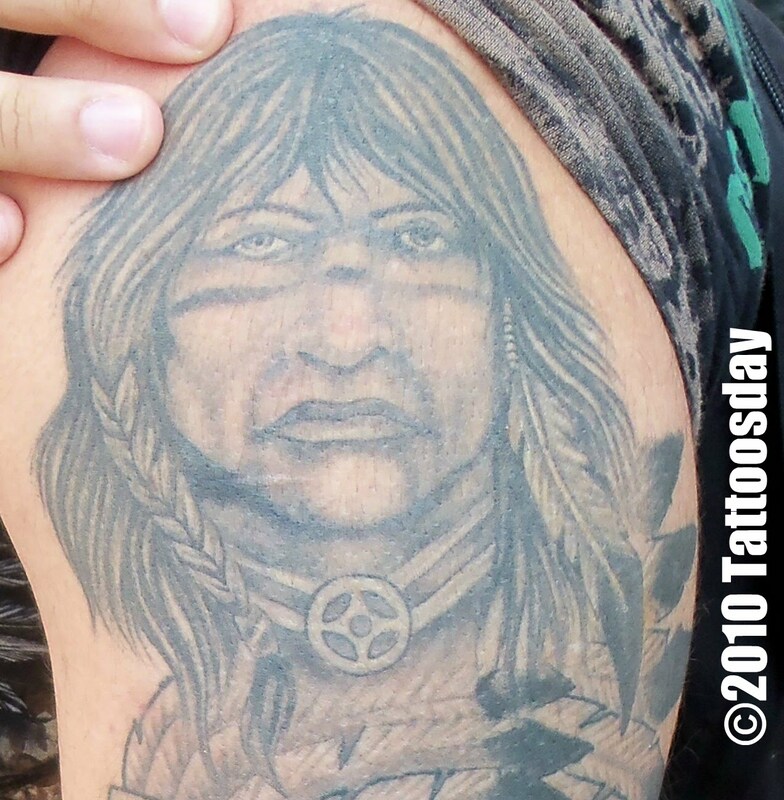 He also likes the way feathers look in tattoo designs, and this eagle's plumage is inked exceptionally well. He credits Jeremy at Imperial Tattoo in Portland, Oregon with this piece. 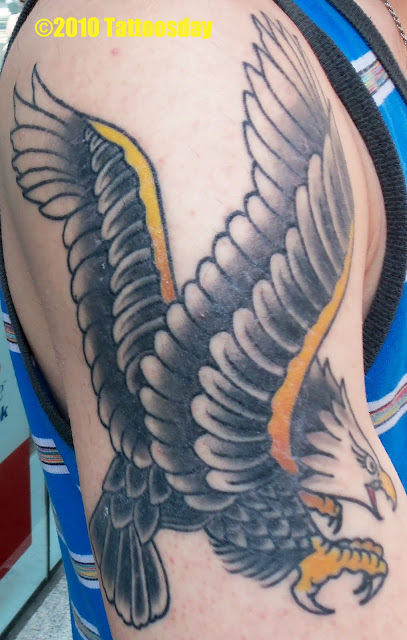 Thanks to Tyler for allowing his eagle to fly here on Tattoosday! 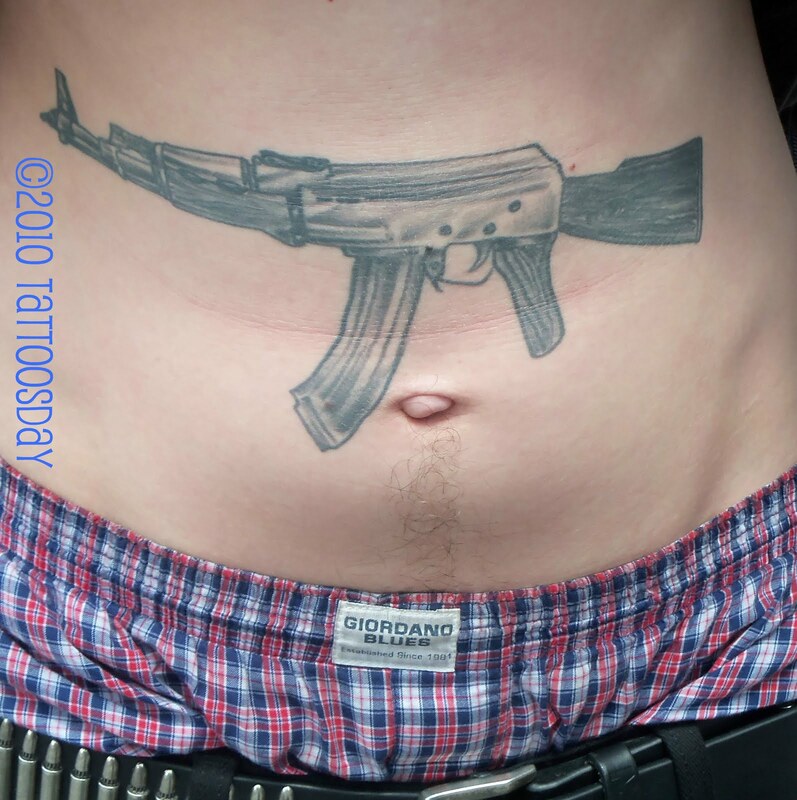 Nick had this AK-47 inked on his stomach to pay homage to his Russian heritage. 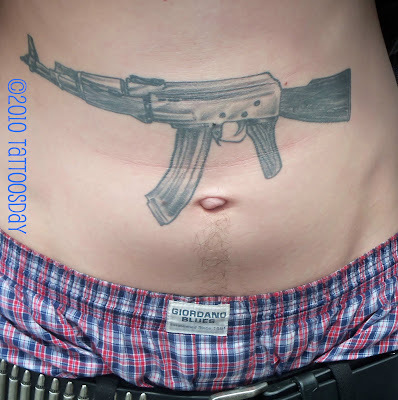 He told me that this tattoo was done by Fernando Alvarez out in Los Angeles. Thanks to Nick for sharing his ink with us here at Tattoosday! I met Simona in Park Slope, Brooklyn, back at the end of July. At the corner of Prospect Avenue and Prospect Park West, just outside of the Holy Name Church. 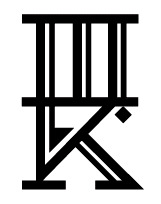 This is written in Tengwar, a script created by J.R.R. Tolkien to represent the Elvish tongue. The text displayed here is the beginning of Aragorn's coronation speech in The Lord of The Rings trilogy. The line displayed is "Et Eärello Endorenna utúlien," which means "Out of the Great Sea to Middle-earth I am come". 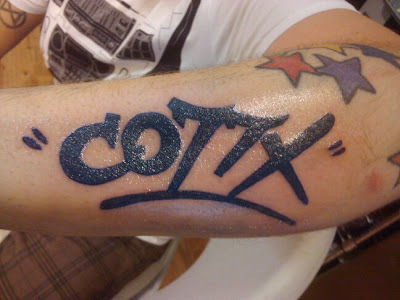 This tattoo was inked by one of the best tattooers of script around, Stephanie Tamez at New York Adorned. Work from Stephanie has appeared previously on Tattoosday here. 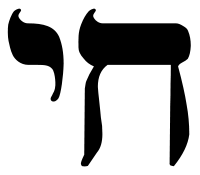 That is Hebrew for "chai" or "life". She placed the tattoo there because that is where Jews who were interned during the Holocaust had been tattooed by the Nazis. It's tattooed there as an expression of solidarity with her faith and, as a reminder to never forget the horror that was the Holocaust. 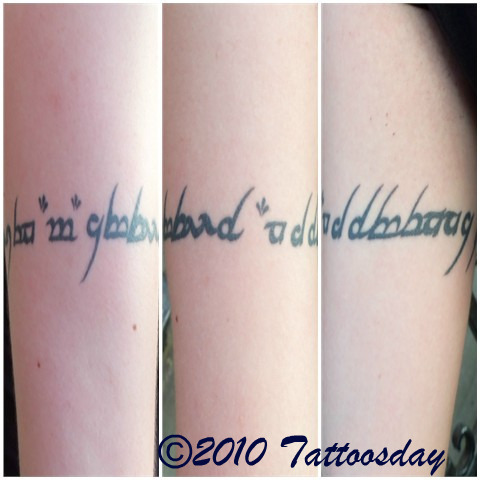 Thanks to Simona for sharing her tattoos with us here on Tattoosday! When I met Chloe back in July, I didn't think that the tattoo she offered would be saved for an anniversary, or a special occasion, but that is how it played out. By crude, I mean unpolished, and I do not mean it disrespectfully. For Chloe disclosed that this was a "stick and poke" tattoo that she and her friend Luke had given one another when in school. Chloe was a Visual Arts major and explained that, in college, everyone seemed to be "poo-poohing on America," and this bothered her. It is occasionally the case where college students, from their campuses, speak out against our country. But Chloe and Luke wanted to make their own personal statements. "We do have a lot here," she told me, and expressed her dismay at those fellow students who seemed to take our freedoms for granted. Chloe loves American culture (especially Westerns) and is "super-jazzed about Americana". Despite the fact that it was not professionally done, it seems appropriate that this tattoo appear here on Patriot's Day, on a day on which we give pause, and remember what America is about. Our freedom is not something to take for granted and, whereas we certainly have a right to voice our discontent with the government, we should also not take for granted the freedoms we do have, those that make us who we are. Thanks to Chloe for letting us unfurl her flag here on Tattoosday, on this day in which we should all pause and reflect, remembering how fortunate we Americans are to live in such a wonderful country. I also encourage people to check out previous Patriot Day posts here, here and here. 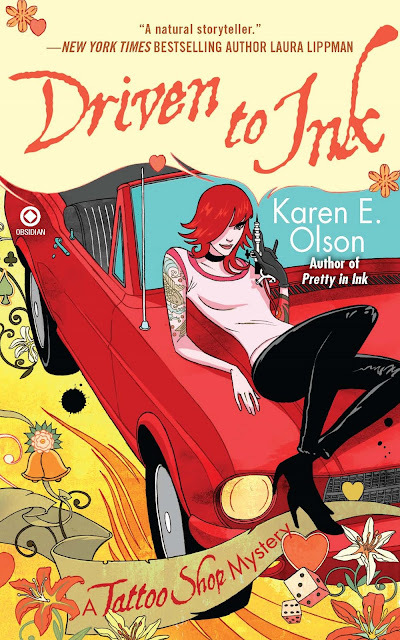 Earlier this week, author Karen E. Olson released the third installment of her Tattoo Shop Mystery series, Driven To Ink. For those readers who may not be familiar with Ms. Olson's series, you can check out my reviews of the first two books, here (The Missing Ink ) and here (Pretty in Ink ). The series features Brett Kavanaugh, a Las Vegas-based tattoo artist, and a cast of supporting characters, from her police officer brother Tim, to fellow artist and competitor Jeff Coleman, owner of the shop Murder Ink. Kavanaugh's staff at The Painted Lady, a high-end tattoo shop at the Venetian Hotel and Casino, also offers up some memorable characters, including Bitsy, the diminuitive shop manager. Driven To Ink , like its predecessors, has an "only in Las Vegas" feel, with a well-crafted narrative that, this time around, revolves around a drive-thru wedding chapel called "That's Amore" that features a handful of Dean Martin doppelgängers crooning, you guessed it, "That's Amore". 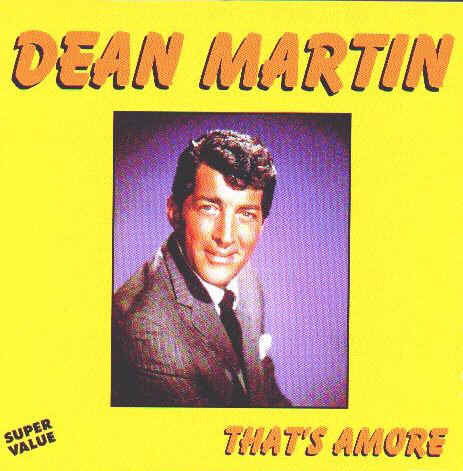 Olson has once again spun a riveting tale, which finds Brett Kavanaugh discovering a dead Dean Martin imperspnator in her trunk, with a tattoo machine's clip cord around the victim's neck. She had just lent her car, a Mustang Bullitt, to Jeff Coleman's octogenarian mother, Sylvia, so she could get married in style at the That's Amore chapel. What I love about Karen Olson's books is that tattoos are seen above and beyond base clues in a murder mystery. She treats the vocation with utter respect, explaining things to the reader as if they were new to a tattoo studio. Tattoos may serve as clues, but they are not regarded as these huge totems that define their owners. Brett Kavanaugh is an enjoyable protagonist, not without faults, and the author let's the reader tag along on her adventures that start off innocently enough, but pull her into deeper and deeper water. It's no surprise that one of the recurring characters is an Emergency Room doctor, as medical attention seems to be needed from time to time, making this mystery series ring truer than one in which the hero (or heroine) dances through their adventure unscathed. Olson's first book in the series was a novelty. A new mystery with tattoos at the center of the narrative. After three volumes, Brett Kavanaugh seems more real, more human, than ever before. A word to the skeptics, those tattoo snobs who may scoff at the light-hearted appearance of these books: Karen Olsen has given a gift to the tattoo community in the form of Brett Kavanaugh. Driven To Ink is another great mystery, with a respectful and honest portrayal of one artist/sleuth who just happens to be a tattoo shop owner. I have enjoyed every one of Ms. Olson's books and Driven To Ink is yet another chapter in the fascinating life of Brett Kavanaugh. I'm looking forward to her next installment which, I am led to believe, is tentatively called Ink Flamingos. Heather credited this to an artist named "Joanne" with a long French name. Any guesses? Anyone? Sadly, I gave him the Tattoosday flier and asked him to e-mail me so we could discuss it further and he a) lost the flier or b) decided to forgo contacting me. So, I have no idea who he is, nor can I credit the artist, whose work is pretty darn impressive. When this happens, I dub it an "orphan" post, but obviously, despite the lack of details, it's still worth sharing. 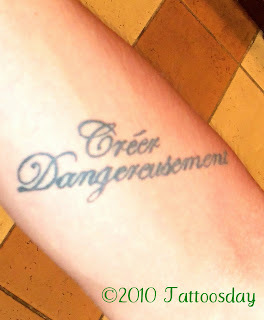 Thanks to the anonymous contributor who allowed me to take photos of this great tattoo and share it with us here on Tattoosday! 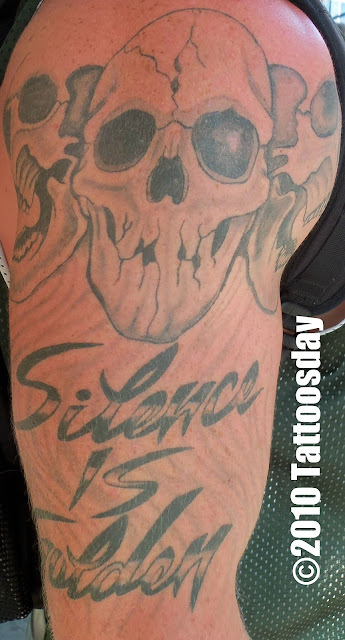 I wanted to start off the new week after the holiday by showing off some amazing tattoos that I was fortunate enough to encounter last week. There are two artists behind these tattoos. First is the painter Mark Ryden, upon whose work these tattoos were based. 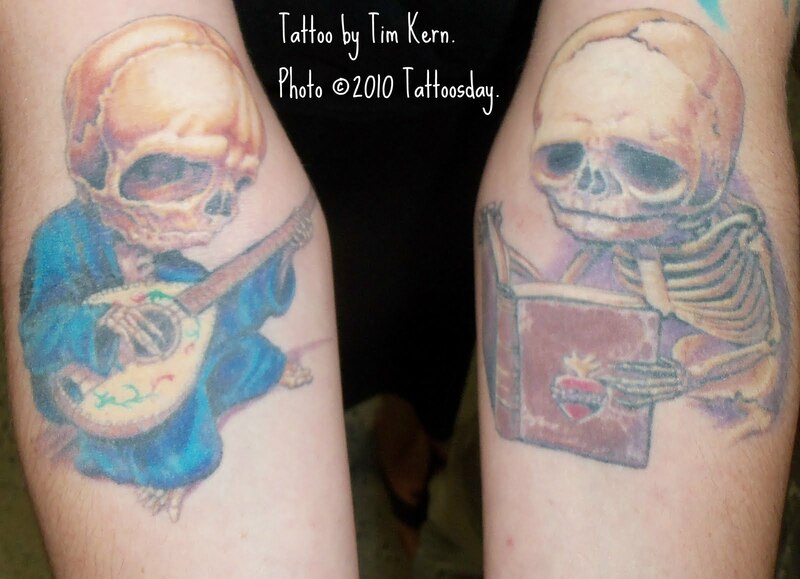 Next is the master craftsman Tim Kern, from Tribulation Tattoo, whose work appeared last on Tattoosday here. No big story, just incredible body art. 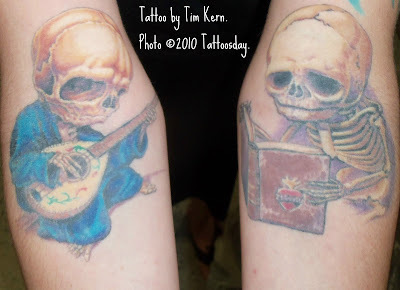 Thanks to Gina for sharing these incredible tattoos with us here on Tattoosday! This chrysanthemum is her first tattoo and sits on her upper left arm. Sarah is a big fan of Eastern art and understands that chrysanthemums are symbols of joy (except in Germany, she noted). 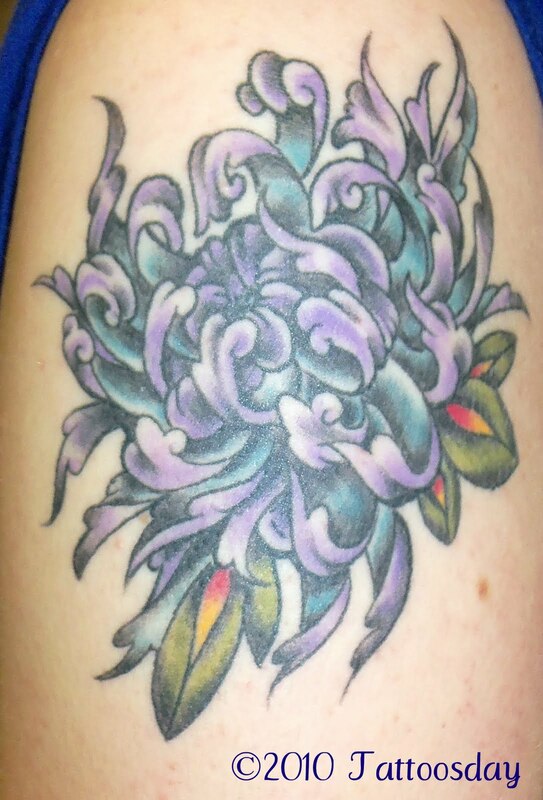 She feels that Russell Kelley at Silk City Tattoo in Hawthorne, New Jersey did a nice job of merging Eastern and Old School styles on this beautiful flower. Work from Silk City has appeared multiple times before and can all be seen under Silk City's Tattoosday label here. 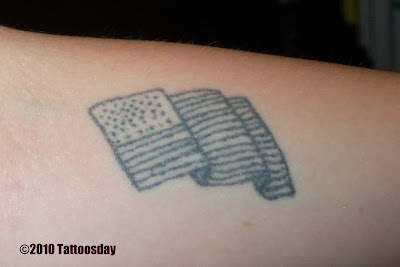 Thanks to Sarah for sharing her tattoo with us, and Happy Labor Day from us here at Tattoosday! Last Sunday, I found myself unexpectedly in my weekday stomping grounds, outside of Penn Station. I saw a couple sitting on the steps in Penn Plaza and noticed the gentleman had a remarkable tattoo on his outer left calf. The tattoo was done by Tom at Stechwerk Tattoo Studio in Kempten, Germany. Rico said he just liked the design and that Hawai'i is somewhere he hopes to visit one day. The surfboard and the archipelago outline are symbolic of our fiftieth state, and the yellow hibiscus is the state flower. Danke schön to Rico for sharing this cool Hawai'i-themed tattoo with us here on Tattoosday!